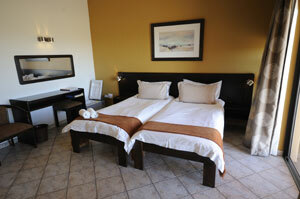 Namib Desert hotels, accommodation and places to stay. 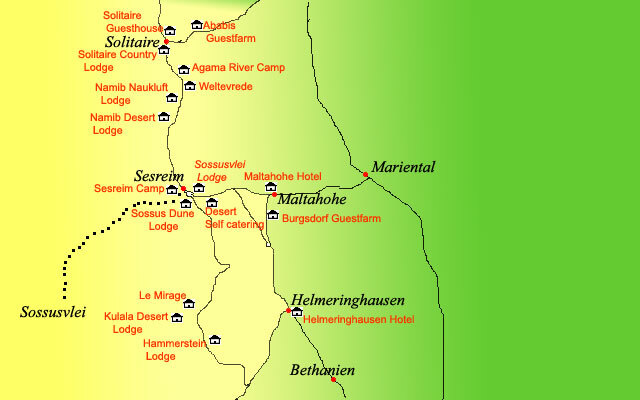 Guide to where to visit and where to stay in Namib Desert Namibia. 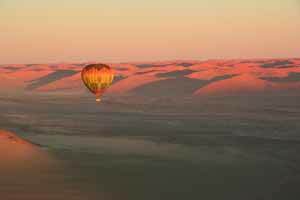 Information on Namib Desert Namibia, location of hotels, lodges, camp sites, guest houses, bed and breakfasts and places to stay in the Namib Desert area of Namibia. 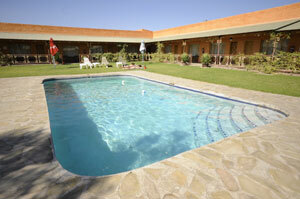 Distances from major attractions to Namib Desert and information about shops, fuel and facilities. 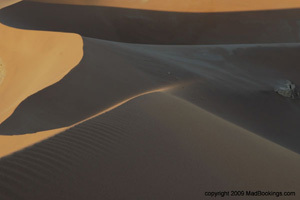 If there is one picture to represent Namibia it would probably be a picture of the dunes in and around Sossusvlei. 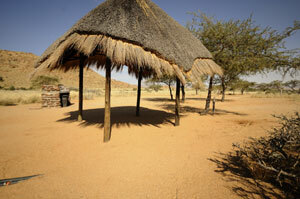 Sesreim - the entrance point into the Namib Desert. 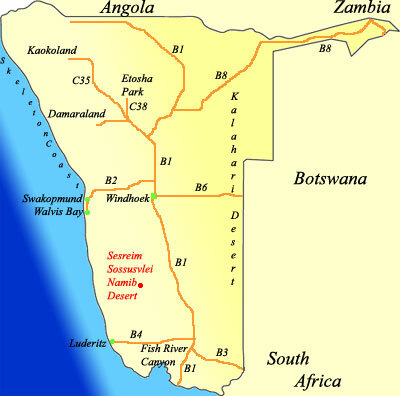 Sossusvlei - Where you drive into to view the dunes around Deadvlei. 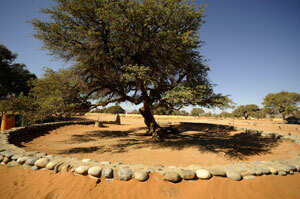 Naukluft - The majestic sunlit mountains that edge the Namib Desert. This luxurious desert resort was built with adobe bricks typical of Arabian villages and tents similar to those of the Bedouin. 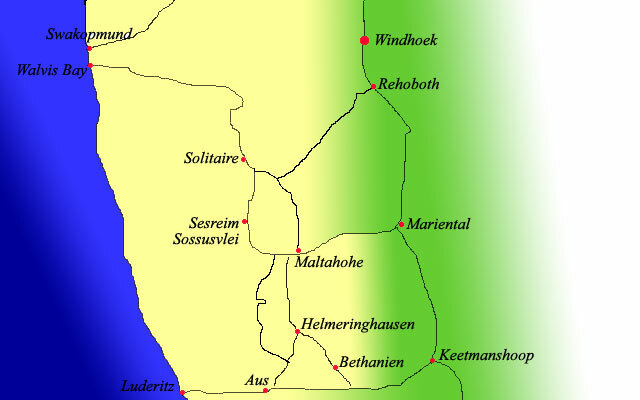 We are situated on the C19, 30 kms south of Solitaire and 50 kms north of Sesriem, approximately forty five minutes from the main gate way to Sossusvlei. 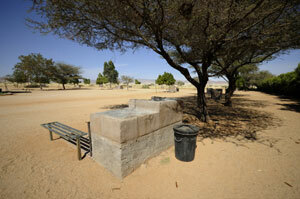 Most visitors utilize our facilities as an overnight access point to Sossusvlei and the Namib Naukluft hiking trails. 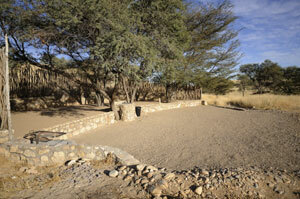 We also offer self guided walks into the mountains. Pre-arranged meals for groups, events and / or individuals as well as breakfast packs are available. For those who don’t have camping equipment we will provide tents, bedding, crockery and cutlery for an additional fee. We do also supply a limited amount of firewood but not ice. 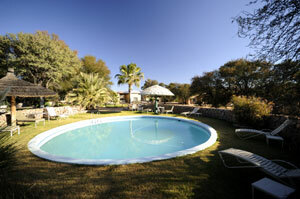 We are connected to the main grid (Nampower) so our chalets and restaurant have a reliable power supply. Listen to the evening sound of the barking gecko – a concert never to be forgotten. The clear night sky invites you to an unreal stargazing experience. Try to spot the Milky Way and the Southern Cross! We’ll show you the oldest desert on earth. Our friendly staff will make your stay unforgettable. 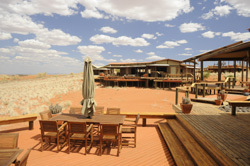 Kulala Wilderness Camp is a nine-roomed camp situated in the heart of Namibia’s Namib Desert on a 46,000 acre private reserve near Sossuvlei. The camp is built at the foot of a mountain and comprises of 9 tents on elevated wooden decks which are linked to the main dining room, bar, reception area and swimming pool by pathways. 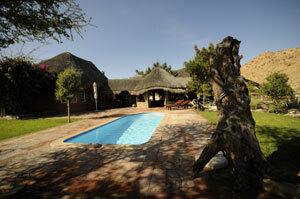 Wolwedans Dune Lodge has a total capacity of 16 bed, with the possibility of a honeymoon suite. 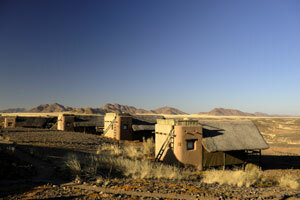 Nestled amidst the dunes in the heart of NamibRand Nature Reserve about 80 km south east of Sossusvlei. 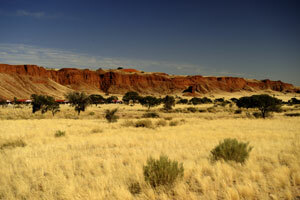 The particular attraction of NamibRand is the diversity of different desert landscapes. 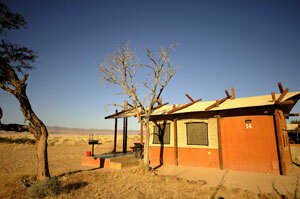 Wolwedans Dune Camp has 7 accommodation units and a lapa area where sundowners, dinner and breakfast is served. 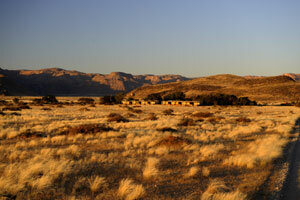 Nestled amidst the dunes in the heart of NamibRand Nature Reserve about 80 km south east of Sossusvlei. 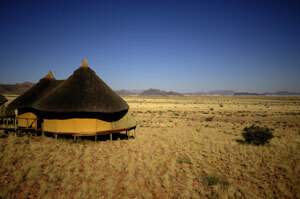 Sossusvlei Wilderness Camp is located in one of the most remarkable sites in the Namib Desert. 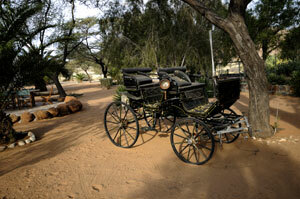 The camp is situated on a 21 000 hectare private reserve, 20 kilometres from Sesriem. 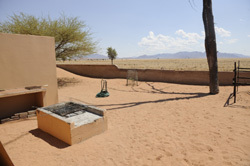 The camp's location provides easy access to Sossusvlei, yet also offers privacy and exclusivity. 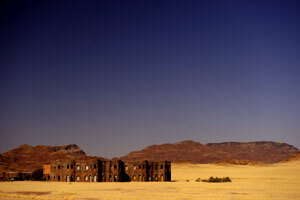 Cradled against the ancient mountains, Sossusvlei Mountain Lodge offers a highly sophisticated desert experience, which echoes and embraces the haunting beauty of its environment. They have 15 twin bungalows, each with its own shower and toilet. 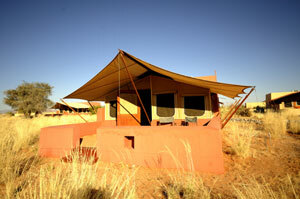 The roof also acts as an open-air bedroom – the guests only have to bring their own mattress and sleeping bag. 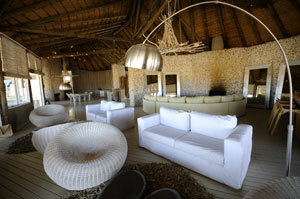 The guest can also experience breathtaking sunsets while sipping sundowners on the “roof patio”. 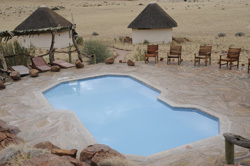 The Lodge is situated on the banks of the Tsauchab river and only 15 minutes drive from the Sesriem entrance to Sossusvlei.